Join us for our May webinar: learning to use project management tools on alpscontrols.com. We’ve mentioned to you a number of times that your customer dashboard on alpscontrols.com offers a robust set of project management tools that will change the way you order control parts for your projects — and save you plenty of time and truckloads of money. But even though we tell every single person we know about these tools, we occasionally meet a customer who isn’t taking advantage of them. So if you’re one of those folks, it’s time for us to bring out our big guns: Jim Kalafatis. The webinar will be about 30 minutes long, and it’s ideal for control contractors, purchasing agents, accounting folks, project managers — pretty much everyone at your company. The only requirement is that you need to have a customer account on our site; if you currently don’t, just click the orange REGISTER NOW link at the top of the alpscontrols.com homepage and we’ll create an account for you before the webinar. If you’re going to the AHR Expo next week, stop and see some of our site’s suppliers! Next week, a handful of us from alpscontrols.com will be traveling to Dallas, Texas to attend the 2013 AHR Expo with a couple thousand of our closest pals in the HVAC industry. Have a terrific time in Dallas, and we hope to see you there! Here are five spectacularly great reasons for you to buy all of your wire from alpscontrols.com. See, we know that wire is important to the everyday operation of getting your building control projects done – but the way that you’re currently purchasing wire for these jobs is, most likely, inefficient and costly. The glorious convenience of one-stop shopping. You’re already coming to alpscontrols.com for so many parts that you need for your projects, but did you know that you could add wire to your shopping cart as well? In fact, you can find hundreds of wire and cable variations on our site, filter them by gauge, conductor, shielding and rating, and choose specific packaging options: reels, in boxes, or reels-in-boxes. This one is a pretty big deal. Pricing on wire and cables is subject to wild fluctuations because copper – wire and cable’s primary component – is a worldwide commodity item.So when most wire distributors quote you a price, you’re never really sure if they’re treating you fairly. Today they might cut you a deal because copper prices are low and they want to win your business; tomorrow they could gouge you on price because the market’s more volatile. So what do you do? You end up spending way too much time and effort chasing the best prices on wire, but you can never truly be sure if you’re getting the best price. We do it differently. Our wire manufacturer ConnectAir International works with us to keep prices consistent and reliable over time, despite fluctuations in market prices. Because ConnectAir buys in bulk, they’re able to keep their prices steadier than just about any other cable supplier in the industry. ConnectAir has specifically designed cables for the controls industry. So that means you can easily find a dependable cable solution for your system on our site – and feel confident that it’s the right one. 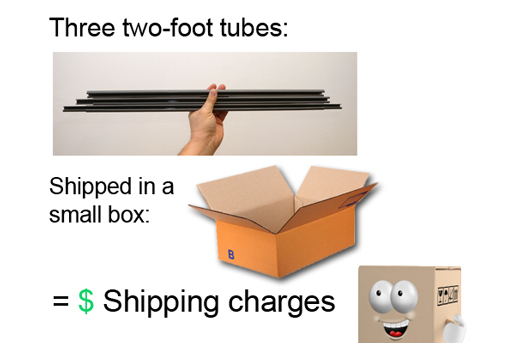 We save you money on shipping, too. We save you time and money on your shipping because ConnectAir sends it directly to you, not to a distributor’s warehouse where it has to be rerouted and shipped again. And even better: ConnectAir has multiple shipping locations (in Anaheim, CA; Atlanta, GA; Boston, MA; Phoenix, AZ; Portland, OR; Seattle, WA; and Tracy, CA), so they can deliver your wire and cable order anywhere in the United States within three days – and they’ll ship it ground freight for free on orders over $1150! We know control contractors and we know how to solve your problems. Our many years of experience in the HVAC contractor world mean that we’re right there on the spot with you if you need advice and support (which you can find on alpscontrols.com right here! ), and we work closely with ConnectAir to ensure that you can get everything you need. 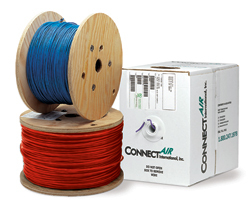 ConnectAir also offers customer-specific labeling options and colors through our site, and doesn’t require minimum orders. 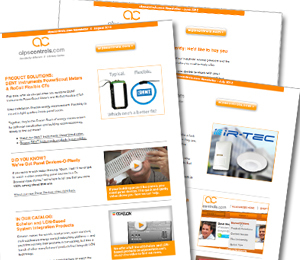 Find out for yourself: browse ConnectAir’s comprehensive product offering on alpscontrols.com. Take a quickie one-question poll about webinars on the alpscontrols.com blog! Here’s the thing: if you’re a registered user of alpscontrols.com, you’ve got at your fingertips an impressive assortment of project management tools that you might not be currently using, even though they could save you serious time and money on your building automation control projects. If alpscontrols.com scheduled a free webinar so that you could learn how to maximize the free tools and functionality of our site to your time-saving advantage, would you want to participate? Yes, that sounds awesome! Where do I sign up? No, are you crazy? I spend enough time at my computer as it is! How the creation of a simple – but brilliant – duct smoke kit solution saves you lots of money on shipping. Sometimes – in fact, lots of times – we’re amazed by the casual way in which our nearly 150 manufacturer-partners come up with new ways to solve problems in our industry. Sometimes it’s through the creation of a piece of technological brilliance: a new sensor chip or a more accurate wireless widget. And sometimes, it’s simply a matter of cutting something up into smaller pieces. Take the example of duct smoke kits, which are small plastic tubes that you stretch across the inside of an air duct in your building. The tubes gather air in and funnel it to a duct smoke detector, which then senses whether or not there’s smoke present in the duct. Then the detector sends a signal to your controller, activates smoke dampers to close – you know the rest. But here’s the thing: these duct smoke tubes are most often purchased in 5- or 10-foot lengths, depending on your application. And they only weigh about a pound, but when you wanted to order them and have them shipped to you, you were locked into paying shipping on a big, long box. Now keep in mind that when you’d order these, you might pay 100% of the cost of the product – or more – just in shipping. Well, someone really smart over at Space Age Electronics looked at this problem and thought “Golly, that’s just not right” (I’m paraphrasing) – and then came up with an incredibly bright and simple idea: invent a new tube kit that breaks down into sections, making it smaller and easier to ship. 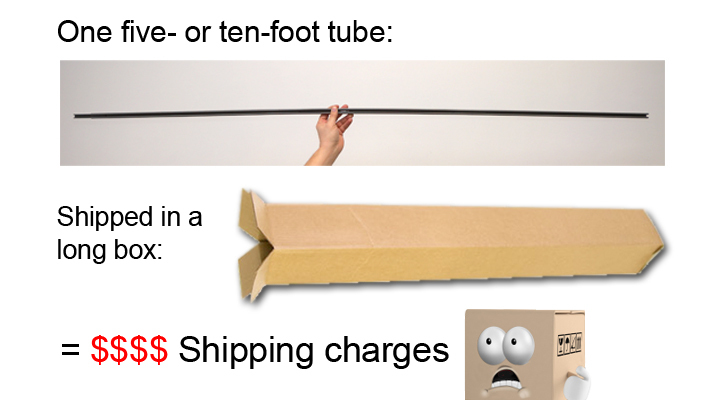 Now you can order Space Age duct smoke kits in 6-foot lengths that separate into three easy-to-fit sections, and you won’t have to choke on the shipping charges anymore. Find Space Age air duct sampling tubes – SSU-FASTTUBE – on alpscontrols.com right here. Are you getting the most out of our new e-newsletter? Here are three handy ways to find out. Since June, we’ve been sending out a monthly newsletter directly to the email inboxes of our customers and pals, and so far the response has been terrific. It’s been a great way for us to connect with both our site visitors as well as our manufacturer-partners, and to share news and product information on a regular basis. Wait, what? I’ve been getting an e-newsletter? Boy, would I LOVE to share the newsletter’s videos and product news with my friends and coworkers. How the heck do I do that? A fine question indeed. If you’ve enjoyed or found valuable information in the content of our newsletters, why not pass it along to your industry pals? You can forward our newsletter directly to others, share it via our pages on LinkedIn, Facebook or Twitter, or encourage people you know to visit the alpscontrols.com homepage and look for the dazzlingly orange Get Our e-Newsletter button near the bottom of the page. Why hasn’t alpscontrols.com sent me some goodies yet? Ah, the best question of all. Here’s the deal: if you share a video you saw in our newsletter* with your staff – perhaps at a weekly meeting – and then let us know about it, we’ll send you some goodies to enjoy at your next meeting. Just send your contact information and which video(s) you shared to buymesomegoodies@alpscontrols.com and we’ll do the rest! If you answered all three of those questions, congrats. You’re officially enjoying our e-newsletter. Any other thoughts or suggestions? Just give us a shout in the comment section below. *or, truth be told, anywhere on our site. alpscontrols.com – an internet-only distributor where flesh-and-blood technical support people make the whole thing work. Let me start out by saying that at alpscontrols.com, we LOVE the internet. We’re huge fans. Each day it’s a thrill for us to engage in this cross-generational, multi-cultural communication space in which opinions and art and entertainment and philosophy and government all come together for the purposes of information exchange and commerce! …Stocking no inventory, having manufacturers ship direct to customers, providing no technical support, and bragging about it. Really? Give us a break, even Clint knows there is no free lunch. One way or another you get what you pay for. Not to name names, but if you are using these guys you have A lready L ost P erspective and S ensibility. To use a phrase popularized by the kids on the internet: we see what you did there! But the fact of the matter is that the statement above gets at least one item glaringly, stupendously wrong: at alpscontrols.com, we do provide technical support. In fact, a good 35% of our staff is dedicated to delivering experienced, immediate, efficient and product-based customer support that also includes specifying and quoting. There’s really no way that our innovative business model could be successful without it, and a large percentage of our customers, when asked about the strengths of our company, tell us that our support personnel are what bring them back to alpscontrols.com day after day. The fact that, in those instances where more comprehensive product answers are needed, we immediately bring our customers together with our manufacturers to find the information they need. There’s complete transparency on alpscontrols.com between suppliers and contractors, primarily because we actually want our manufacturer-partners to know who their customers on our site are. We’re just funny and generous like that. Here’s the thing: there is still a need in the marketplace for local brick-and-mortar distributors to provide the immediate gratification of inventory-based product sales. Heck, sometimes we even purchase products from local distributors, and they buy from us as well. But our business model is designed for — and successfully fulfills — a much broader, global need. In a single online space, we’re able to offer over 8 million products that couldn’t possibly be warehoused efficiently; we handle hundreds of transactions every day for control contractors who seek a cost-effective way to order an entire project’s specification list on a single purchase order. And sure, we do it without stocking an inventory, and by having our suppliers ship directly to our customers — but we do it because it provides value and efficiency not only to our customers who appreciate it, but also to our manufacturers who, freed from the time and personnel it takes to support product transactions, are enabled to spend their time doing what they do best: design and create new and better products. If you have any questions about our ability to provide technical, specification, product, or sales support, we’ll tell you what: why don’t you simply contact our non-existent support folks and find out for yourself? Take a look at our YouTube page, which is full of videos where you’ll get product support, insight into our business, quick tips on using our site, and a laugh or three. Eddie Johnson seeks to build, bolster – and yes, even nurture – supplier-manufacturer relationships as our new VP Vendor Development. With an ever-growing list of more than 150 supplier-manufacturers that represent the best and brightest in our industry, it should be a shock to exactly no one that we found a guy to create, maintain and strengthen those relationships who is himself among the best and brightest in our industry. 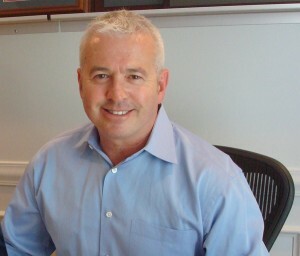 Enter Eddie Johnson, our new VP Vendor Development at alpscontrols.com. Eddie brings with him a wealth of experience in OEM relationships, building automation controls, wireless technology and in working directly with control integrators and the particular challenges they face in leveraging high-end technology in the creation of modern, energy-smart buildings. 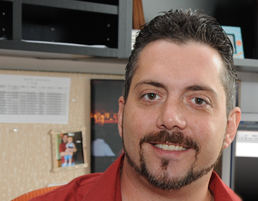 Most recently, Eddie was Director of OEM Sales at EnOcean, where he worked to get manufacturers to embed EnOcean wireless- and batteryless-enabled technology into their products. He also helped get our sister site enoceanparts.com up and running; it’s the first and only site online where EnOcean-enabled parts can be purchased from multiple manufacturers. I am a passionate believer that what we have is the best way to buy stuff! What I want to do is to build on the phenomenal success that we’ve created — not only in exposing new suppliers to our existing customer base, but also in expanding how our current manufacturers interact with those who use our site. It’s a two-way street: we help buyers and sellers find each other, then we make it possible for them to easily transact business together, to their mutual benefit. Originally from England and having lived in Europe, the Far East and the Middle East, Eddie currently resides in Louisville, KY, where he has a 13-year-old daughter, a 10-year-old daughter and 10-month-old son. He’ll be traveling extensively for his new position, and will be based both out of our Pittsburgh, PA, offices as well as his home office in Louisville. Find out more about Eddie Johnson here. Should your company be selling its products on alpscontrols.com? Let us know right here and Eddie will get the ball rolling. Would you like free shipping on all Setra Systems SRH orders for the whole summer? Yes. Yes, you would. “Accurate,” “durable,” “dependable” and “reasonably priced” are just a few of the words you could use to describe Setra Systems’ spectacular line of SRH humidity sensors. Well, go ahead and add “shipped for free” to that list, starting right now. Because if you visit alpscontrols.com from now through August 31, 2012, and purchase a Setra Systems SRH wall mount, duct unit or outdoor mount humidity transmitter, your entire Setra Systems order will ship for free. Soak that in for just a moment. You won’t hear a better summer offer unless Duran Duran reunites and plays a half-dozen shows at your local Ribs ‘n’ Wings Festival. Tell you what: we’ll stop bending your ear about it. 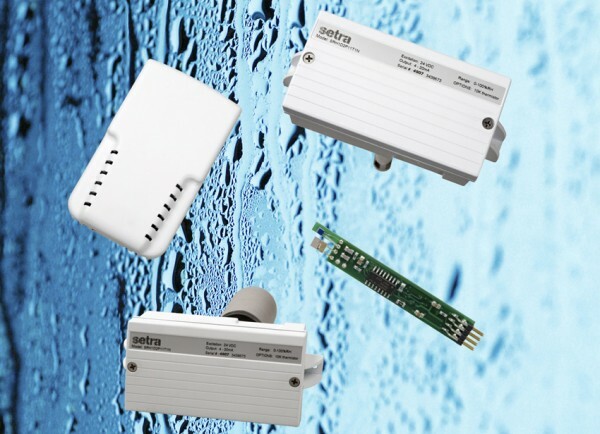 Go take a look at Setra Systems SRH humidity sensors on alpscontrols.com right here and see what you think. Offer good from 6.1.12 through 8.31.12. Customer must order at least one SRH transmitter and ground shipping charges are free for that Setra order. Continental United States only. 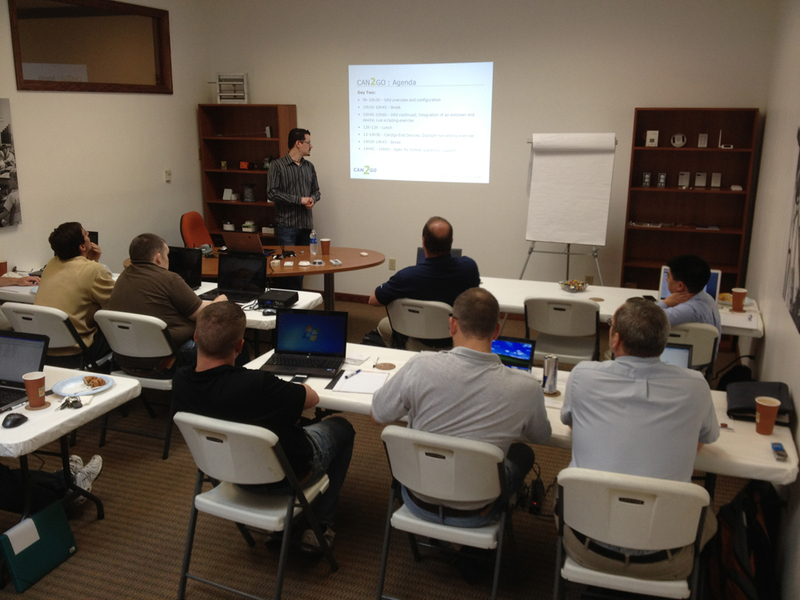 All this week at alpscontrols.com: exclusive U.S.-based CAN2GO product training for control contractors and system integrators. We’ll be giving you a few peeks this week at the exclusive CAN2GO product training we’re hosting here in our offices, so if you weren’t able to attend, check back here to see what’s new. And naturally, we’ll be having more of these in the future, so stay tuned.